Iris; West Pediment of the Parthenon. 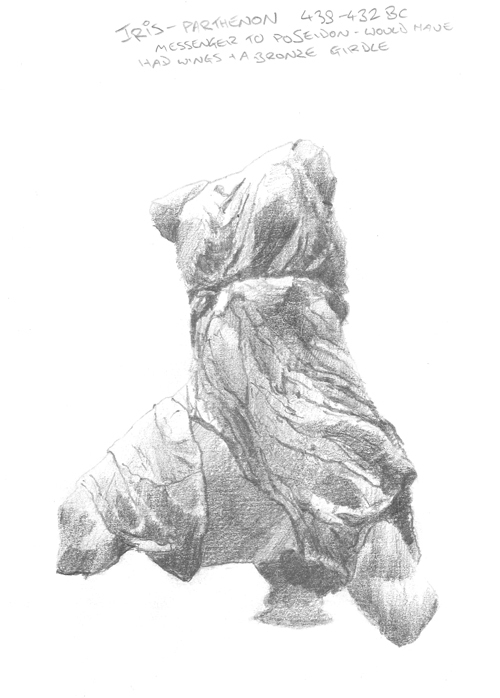 Another sketch of Iris from the West Pediment of the Parthenon found today in The British Museum. Originally this sculpture of Poseidon's messenger would have had wings and a bronze girdle. Athena and Poseidon were shown on a colossal scale at the centre of the triangular composition. Both Athena and Poseidon were accompanied by divine messengers, Athena by Hermes, Poseidon by Iris. Her zestful pose suggests to me that she is just alighting on the Acropolis from the heavens.